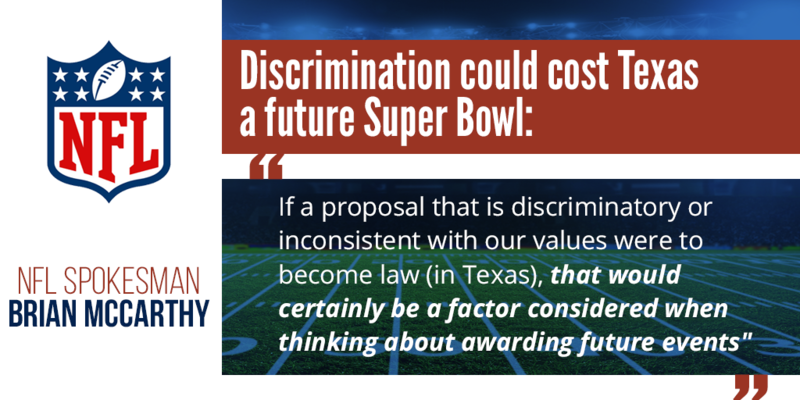 Discriminatory legislation that was recently filed in the Texas legislature could put Texas’s next Super Bowl in jeopardy, according to comments made this week by representatives from the NFL. In an interview with the Houston Chronicle, NFL spokesman Brian McCarthy indicated Senate Bill 6, which would ban transgender people from using restrooms in public places, would be taken into consideration when the NFL picks future Super Bowl locations. SB 6 is disturbingly similar to North Carolina’s House Bill 2, which has cost the Tar Heel state nearly a billion dollars in revenue and thousands of jobs since it was passed into law in March 2016. Much of the lost economic activity is from canceled sporting events, including 7 college sports championships the state was scheduled to host before the NCAA pulled them as a response to the discriminatory law. The impact on Texas’s economy could be similarly dire. The Texas Association of Business—a founding member of Keep Texas Open for Business, a business coalition that advocates against economically harmful legislation—has warned that discriminatory bills like SB 6 could cost Texas potentially billions in revenue and hundreds of thousands of jobs. The impact would be greatest on the tourism industry, which brings in $69 billion a year in direct spending and supports 648,000 jobs. That’s why hundreds of Texas businesses are using platforms like Texas Competes to make the business case for keeping discrimination out of Texas. Texas Competes is a nonpartisan coalition of more than 1,200 businesses across the state that aims to provide a unifying voice for Texas businesses that know equality and diversity are key to keeping our state’s economy vibrant. If you’re a Texas business owner who shares these values, click here to learn more and sign our pledge.